There is a particular type of ambiguity in an artist's work that always draws me closer. It is the sense, when everything you have been shown is so acutely observed and planned,that something is being withheld or is evading us. In "The Village Is Quiet" by Patrick Hartigan at the Darren Knight Gallery in Waterloo this is exactly what you feel. It's the sense of the ineffable, that the surface, a snapshot of narrative perhaps, is a signal for something larger. Hartigan captures this with minimum expression. 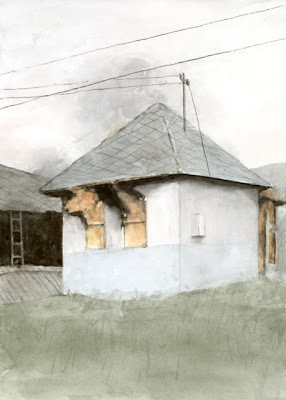 His style is deadpan, pencil drawings waste the minimum carbon and his watercolours are economical, more likely to use the brightness of the paper bursting under thin wash for an effect than adding another layer. This doesn't stop them picking up detail, but only the ones we need to take us from the general to the specific: the uneven texture of grey rendered wall, or the pink hint of a blood stained hunting bag. 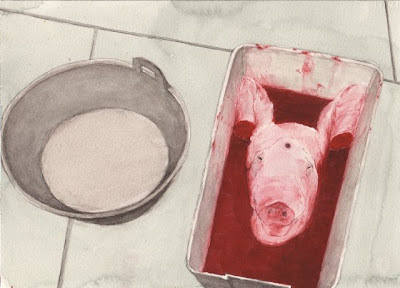 'Pig Day', a water colour, shows how the fleshy pigness of shape and colour, together with the coagulating wash of red tell us all we need to know of what is here, but the bolt-hole in the pigs forehead is the telling detail that delivers the realness of the scene. 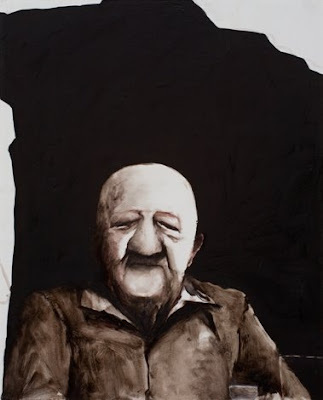 Just as he uses a muted palate that is more likely to be the memory of a colour on porous object than the colour itself Hartigan also knows that we often find truth, or perhaps just verisimilitude, in small gestures. The angle of a head or tidemark of paint on a wall are more telling than captions. In doing this Hartigan's restraint means that some of his images are almost as economical as an ideogram, whilst always feeling well enough observed to link to the back to a captured moment. 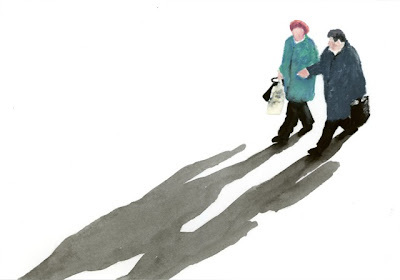 Across these drawings, watercolours and oils size is a unifying feature. Scale is important for Hartigan, most of the pictures are only a few inches across, and it's curious how this draws you close you into his world. You can't help but lean in to engage with these small pictures of potentially mundane life, it's a refreshing and polar change from the grandiose and alienating gigantism that we see elsewhere. The work here has the feel of a set of snapshots, not just in size but by the way that Hartigan manipulates framing and point of view. Rather than cinematic these angles seem polaroid, we see things from where we might be when they catch our eye, we look down from a window at women walking home, find a pig's head on the kitchen floor or notice a house in the unframed middle distance. In essence Hartigan does show rather than tell, or at least rather than point. This seemingly artless effect combined with a minimum of extraneous detail can be a tool for suspense; as we wonder who set a house on fire, or empathy; we can't help feel the cold and anticipation as a woman stands at blasted bus stop. No-one was in the street today. It was quieter than ever. Only one man in a dirty green parka, hood darkening his face. He came down-village like the grim reaper as I carried bags of bread and milk. An empty sack hung from his shoulder. "There is that sound, of the water’s rhythm, irregular in some intelligent way. Ears try to decipher dripping into an unknown music"
At least it doesn't resolve the hinted narrative, which is a huge relief. Furthermore, in a room at the back of the gallery a silent super 8 transfer runs in a continuous loop, guileless and barely edited footage of, what appears to be, Central European country life. The words and video work in parallel with the pictures, ocassionally crossing but equally easily ignored. They do make the whole seem that bit more strange, but they're unnecessary. It says much that the pictures are more eloquent without them. Hartigan seems to understand memory. He knows how the picture in our mind's eye is fading and unruly. These pictures are so effective because, like an eye-witness searching for details, we believe those things that are too clumsy or unnecessary to be lies. 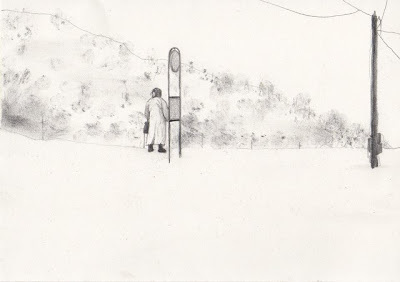 So, in 'The Village is Quiet' we find a host of small observable truths of a mundane and mysterious world, which feels just about enough to me.